A pet peeve of mine is being critical of websites. I hate most websites…for a very long list of reasons. 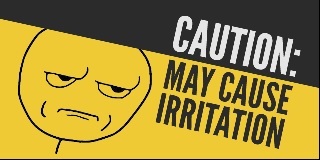 But when it comes to preparedness websites I really don’t like most of them. Why? Because the information I want is buried and hard to reach…as in confusing and poorly organized. I will attempt to organize this preparedness website so it is much easier to use and to find the information that you need. 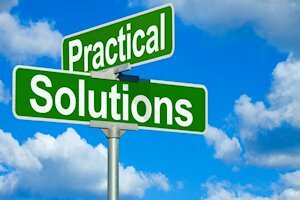 So, as you know by now there are two primary areas of how I view emergency preparedness; 1) principles, 2) the practicals. That is how I am going to organize the website. But, there are a couple other considerations as well; my books (published and online), as well as SitReps, FAQs, etc. So I do have to take those into consideration and weave them into the overall organization. I think I’ve got it now…but I may tweak it from time to time. Principles of Preparedness: This area will explain the underlying foundation of preparedness. 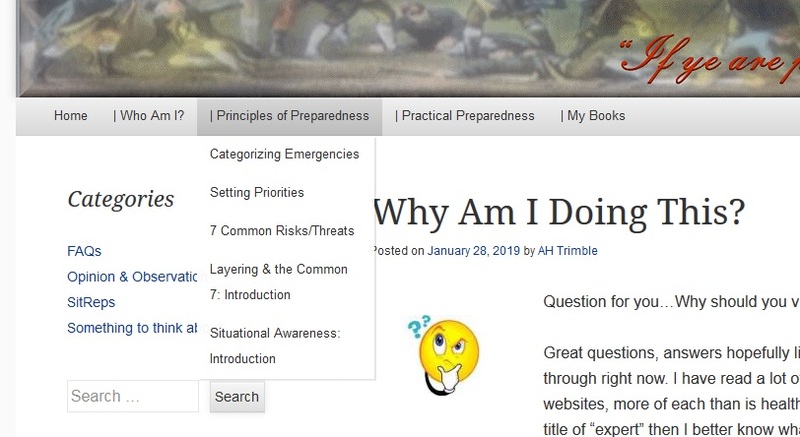 I will go into why we do preparedness and the supporting concepts behind it. It will be a learning process…an education if you will. DO NOT UNDERESTIMATE THE VALUE OF THIS INFORMATION! I want to emphasize that you read this information before going into the “practicals”, it will make the overall learning, or information gathering, process much easier. Would you build a home’s roof first? No! You would lay a solid foundation first. 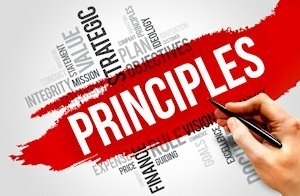 Read the “principles”!! Practical Preparedness: This area will focus on the seven threats, in priority order, to all emergencies, disasters, and grid-down situation. Those areas are; 1) Violence, 2) Injury/Sickness, 3) Poor/No Communications, 4) Poor/No Organization, 5) Dehydration. 6) Starvation, 7) Exposure. This are will consist of detailed information on how to overcome each of those threats. All practical information will be grouped under those main categories. That should make it very easy to find what you are looking for. 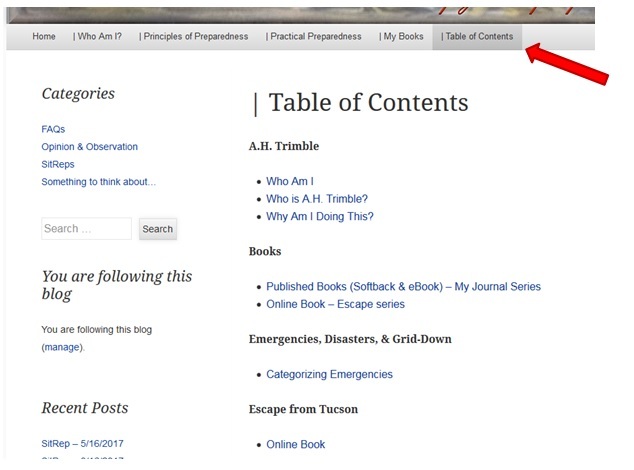 Example: You want to know what food to store and how…You look under the “Starvation” category and a list of pages will appears that cover that topic. 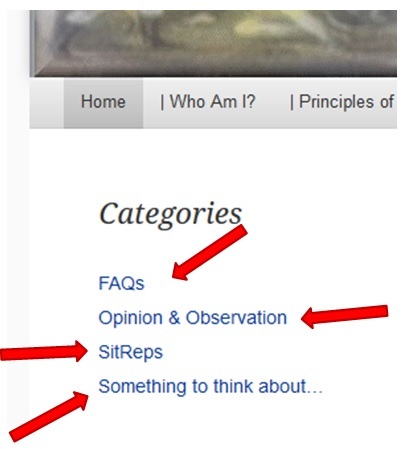 To find “principles” and “practicals” use the main menu bar across the top. 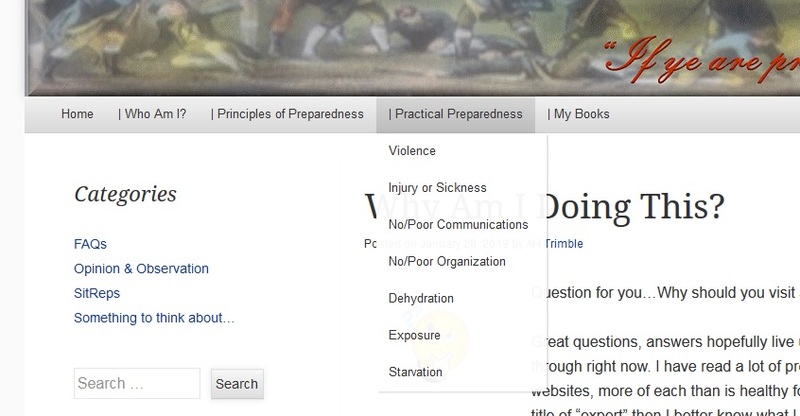 Hover over each and you will see a drop down menu showing the available articles. Choose the article you wish to read and enjoy! Yes, I have put the articles in order of importance. Yes, that means start reading at the top and work your way down the list. 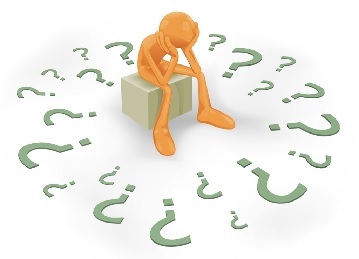 There are other areas of information, answered questions, observations, opinions, etc. Those articles will appear in categories on the left of your screen. Pick a category and a list of articles will appear on your screen…ALL of the articles related to the category. So the page may become rather long. Scroll down and read what you want. There will also be a page to read about who I am “Who I am” that is pretty self-explanatory. Click on it to get to know me better. My Books – I have written and published two books (My Journal series) to print and eBook. 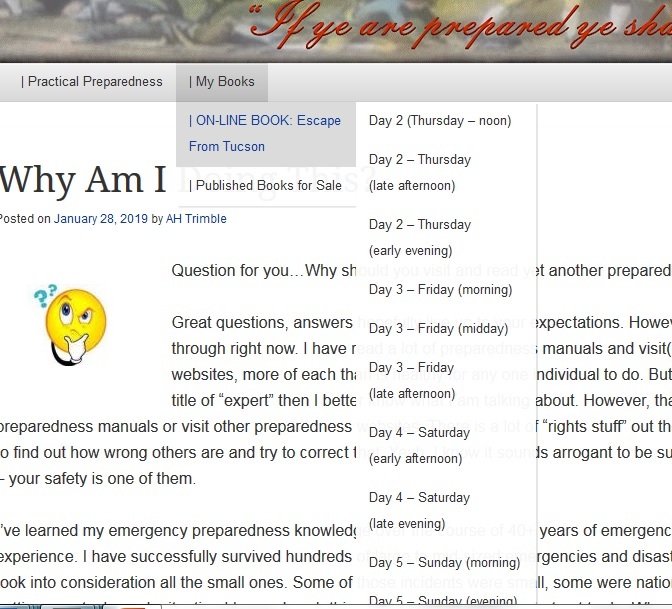 I have also written a book (Escape series) that appears online with each day as a separate post. To view these books click on “Books” and the page will explain the two series. Click on “My Journal” to view a page on how to buy either of those books. Click on “Escape series” to go to a page that shows you how to read them online (yes for free). Table of Contents – And of course there is the good ole standby…the Table of Contents. Look up a topic and click the link. Arranged alphabetically with as much logic as I could come up with. Page vs. Post – The website software that I use has two different types of methods of posting to my website, pages and posts. Posts appear on the main page and then under each category on the left. Pages only appear on the main menu bar at the top or under one of those pages. Yes, that means the pages are like a tree of information. I know “followers” receive an email letting them know that a new post has appeared. I don’t know that to be true for a page. So you have to come back to the website often to look for new information in the principles and practicals areas. As always…I would love to hear what you have to think about all of this. I value the feedback and a lot of the changes to the website have been generated by user input. Feel free to let me know what you think! This entry was posted in ** How to use this website. Bookmark the permalink.